Resource > DVD > How to Play DVDs on Xbox One? Summary: How to Play DVDs on Xbox One? 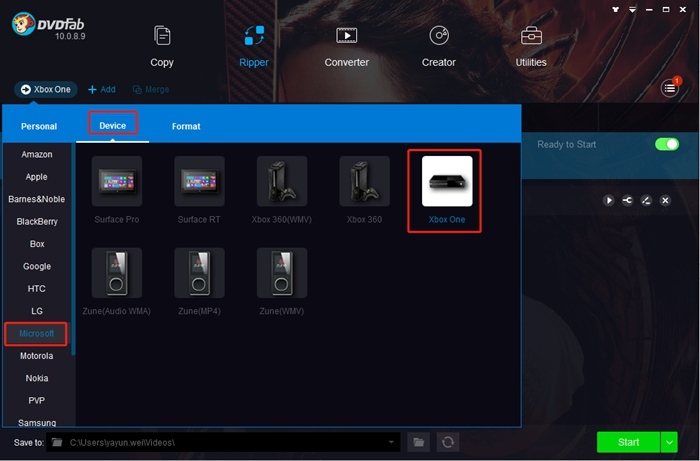 This article shows you how to play DVDs on Xbox One with the dedicated Blu-ray Player and how to convert DVDs to Xbox One supported videos with DVDFab DVD Ripper. Xbox is one of the most popular home video game consoles developed by Microsoft. But can Xbox One play DVDs? The answer is yes. As the successor of Xbox 360, Xbox One also comes with an optical drive that can be used to play back not only DVDs but also Blu-rays. The newly released Xbox One S and Xbox One X even can play 4K UHD Blu-rays and 4K video sources with HDR10 support. You may think the playback of a DVD movie is as easy as inserting a DVD disc to the disc tray of Xbox One, but the fact is that you still need to turn to a separate app to do the playback job. Also, there are times when Xbox One fails to play DVDs due to region code or some other copy protections, and therefore you should first convert the DVDs to Xbox One compatible video formats. So how to play DVDs on Xbox One? Now please follow me to get through the ways of playing DVDs on Xbox One. The playback of DVDs or Blu-rays on Xbox One is not as intuitive as you think, and there are some extra steps involved. Microsoft doesn’t bundle a DVD/Blu-ray player with Xbox One, so you need to download and install the dedicated DVD/Blu-ray player first. Now I will take you go through the detailed process. 1. Turn on your Xbox One, and hit the Xbox button on your controller to open the guide. 2. Choose Home, and then go to the Microsoft Store. 3. Type “Blu-ray Player” into the input field and search it. 4. Select the “Blu-ray Player” to open the store page. 5. Click the “Install” button to download and install the Blu-ray Player to your Xbox One. 6. Hit the Xbox button to return to the main dashboard. 7. Insert your DVD disc, and then you can click the “Play disc” title to play the DVD movie. 1. Insert a DVD disc into the disc tray of your Xbox One console. 2. The Blu-ray player app will show up on the screen. 3. Select it to open the app page and hit “Install” to download it to your Xbox One. 4. Go back to the dashboard, and click the “Play disc” option to play the DVD movie. It is simple and convenient to play DVD discs directly with Xbox One. However, it is much safe and more reliable to rip and convert DVDs to Xbox One compatible video formats and play them on Xbox One through a USB stick or your network attached storage. The Xbox One S and Xbox One X can play DVD discs safely in a vertical position, while the 2013 Xbox One can only play DVD discs in a horizontal way, so you are at the risk of damaging your DVD disc. Moreover, sometimes when you play a DVD disc, you may find that Xbox One are unable to open it because of region code protection, Disney copy protection or other protections. When the above situations happen, the best solution is to use a DVD ripper like DVDFab DVD Ripper to rip and convert the DVD to Xbox One or the video formats that Xbox One supports. Click here to learn the video formats supported by Xbox One. 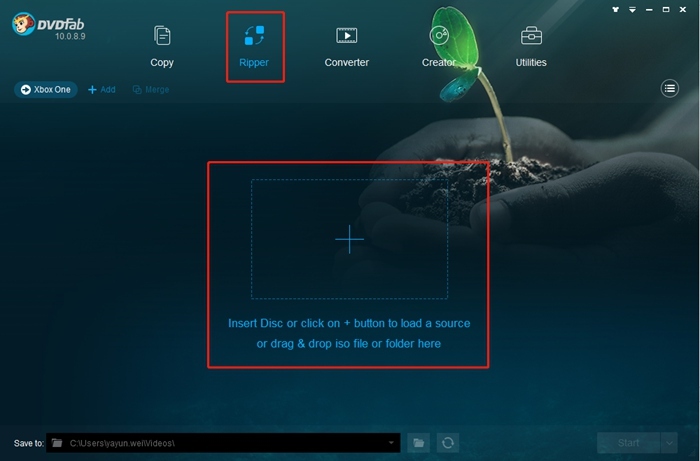 DVDFab DVD Ripper is the best DVD to Xbox One converter that not only can convert any DVDs to Xbox One supported common formats like AVI, MKV, and more but also can rip DVDs to 4K videos supported by Xbox One S and Xbox One X. With the support to advanced hardware acceleration technology, this DVD to Xbox One converter can output high-quality videos at a lighting fast speed. DVDFab DVD Ripper also provides many advanced options for you to customize your settings and edit the videos. It is available for both Windows and Mac users. How to Convert DVDs to Xbox One Compatible Videos? Step 1: Launch DVDFab 10, go to the Ripper module, and load the DVD source you want to convert according to the instructions on the main interface. Step 2: Go to the profile library on the top left corner of the main interface. You can click Device > Microsoft to choose the Xbox One profile, or you can click Format > Video > General to choose a video format supported by Xbox One, or you can click Format > Video > Filter > 4K to choose a 4K format you want. Step 3: The main movie title has been selected by default, but now you can click the “Choose Other Titles” to select the titles you want. You can also change the title name and select the audio tracks and subtitles you like. There are also “Advanced Settings Panel” for you to tweak your settings like codec, frame rate, resolution, etc. and editor tool to trim, crop videos, add watermark and subtitles, adjust picture values and more. Step 4: Move to the bottom of the main interface and click the “folder” icon to select a directory to save the output video. And then you can click the “Start” button to start the process of ripping the DVD to Xbox One. The conversion will take a few minutes. When the conversion is complete, you can play the video on Xbox One by using a USB stick or through your network attached storage. 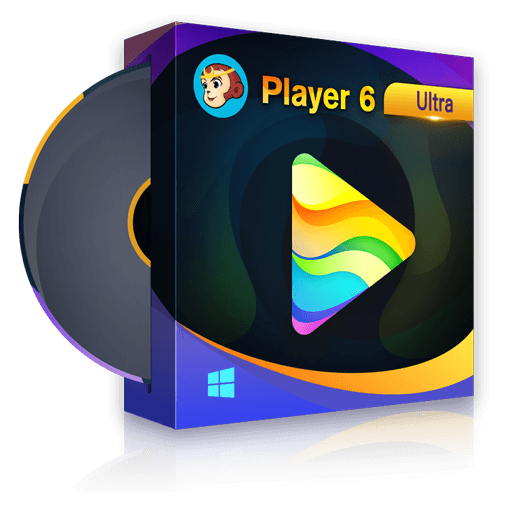 If you also are looking for ways to play DVDs on Windows 8, click How to Play DVDs on Windows 8 to learn more.